Chinese companies are expanding into space: China has bolstered its BeiDou satellite network to assist the growth of the Belt and Road Initiative. Although the Belt and Road Initiative (BRI) is nominally divided into the realms of land and sea, official guidance encourages Chinese companies to expand to the “final frontier” as well. The Belt and Road-branded push includes the goal of constructing a Spatial Information Corridor, so Chinese space tech companies are going out into the world. The BRI space initiative is described with lofty language – companies are “strengthening China’s efforts to harness space for earthly development and planet-wide progress.” But in practical terms,Chinese companies see opportunities to expand their businesses, while the Chinese government sees these companies as worthy, high tech representatives for its interests abroad. Some opportunities do also exist for American businesses, though the risks may outweigh the potential gains. The Spatial Information Corridor project aims to augment economic development coming from BRI by offering new services in communications, imaging, and broadcasting technology. Guidance from the National Development and Reform Commission (NCRC) lays out how this can be carried out through public-private partnerships or by encouraging governments playing a role in BRI to purchase “more spatial data and services,” according to a Xinhua Finance article about the program. Examples of Chinese companies benefitting from the push to expand satellite and telecom networks are plentiful. In January, Cambodian officials inked a deal with China Great Wall Industry Corporation (CGWIC) to build and launch Techo-1, a communications satellite, as well as provide the elements needed to support the launch, like ground facilities and insurance. CGWIC has also signed a contract with Indonesia to launch a new satellite system in 2020, built and launched the first Laotian satellite in 2015, and is planning to build and launch a satellite for the Belarusian State University in October of 2018. Although the Cambodian satellite is the only one that was explicitly tied to BRI in its announcement, the other programs all fall within the area encompassed by Belt and Road and align with Belt and Road’s stated mission. While it might not be strictly accurate to consider the launches themselves as part of the Belt and Road, it seems likely that the services they offer will be used to bolster the Initiative’s progress. These deals are likely to continue in the future as well – Yuan Minhui, Director of the Beijing Institute of Space Science and Technology Information told China Daily that he believes that China will represent ten percent of the satellite market by 2020. Although the rationale may center on business, there are also policy, security and geopolitical implications for the development of the Spatial Information Corridor. The Chinese government views the development of space technology, particularly satellites, as essential to driving the Belt and Road Initiative. In a 2016 publication, the NDRC referenced China’s advances in satellite technology, space cooperation agreements with around 30 countries, and the importance of spatial information services to boost the abilities of Chinese companies as they are ‘going out’ into the wider world. Likewise, a China National Space Administration (CNSA) presentation to the UN’s Outer Space Agency (UNOOSA) stated explicitly that advancing China’s space technology would “serve national security and national economic and social development” goals. 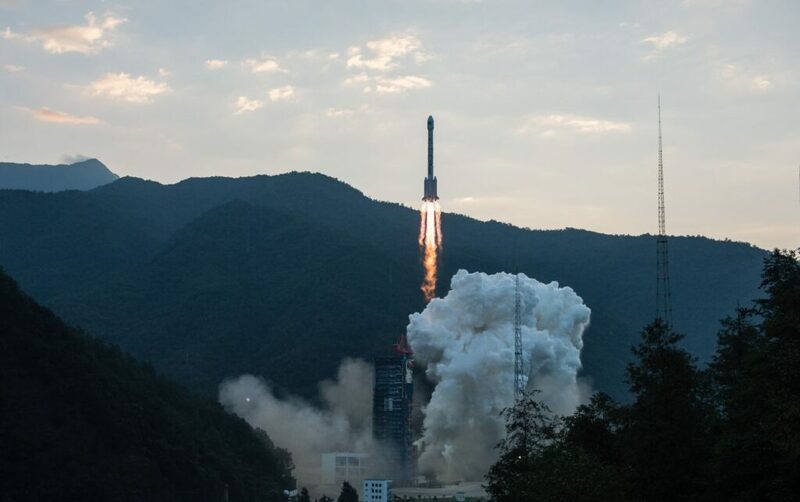 The development of better satellites is also a prerequisite for the State Council’s plan to ultimately replace the GPS system, operated by the US Air Force, with the Chinese-run BeiDou Navigation Satellite System. This system, which would be a competitor to the US’ GPS system, Russia’s GLONASS, and the European Union’s Galileo system, would bolster the Chinese military and government’s ability to have full independence from imaging, communications, and geolocation services powered by American technology. In addition to the development of a Chinese-run global navigation system to rival GPS, GLONASS, and Galileo, the development of further satellite technologies is part of a broad, government-wide quest to present China as a global leader. Increased participation in international organizations, the development of Chinese overseas media and cultural projects, and major investments through the Belt and Road Initiative all play a role in the cultivation of China’s image at the forefront of the global community of nations. Especially in today’s international political climate, with the United States seeking to “[keep] more of America’s hard-earned tax dollars here at home” and enacting “deep cuts to foreign aid,” Beijing is seeking to foster its image as a responsible and advanced global leader. Chinese satellite and space developments have added a high-tech sheen to this image. Not long after President Trump floated the idea of creating a Space Force in remarks to the Army academy football team, Xinhua was promoting an interview with UNOOSA Director Simonetta Di Pippo praising the Chinese for the planned 2019 launch of the China Space Station and how it would “reinforce cooperation for outer space’s peaceful use.” The continued expansion of the BeiDou system and satellites designed and launched by Chinese companies in a range of countries also help lend credibility to the narrative of an emerging China. Like many of the projects related to BRI, the opportunities available to American companies to participate in the development of satellite infrastructure and the Spatial Information Corridor are currently negligible. CSIS’ Jonathan Hillman testified that of the contractors that participated in Belt and Road projects, around 90% were Chinese, 7% were local, and only 3% were foreign. Compare that to other multilateral development projects, where those numbers are around 30%, 40%, and 30%, respectively. That said, even when Belt and Road plans bring in Chinese companies to tackle large infrastructure projects, there is still opportunity for western companies. A range of firms have pointed to the Belt and Road as a significant opportunity for growth. For example, an American insurance company has partnered with PICC Property and Casualty company of China, a major Chinese insurer, on a ten-year deal and American multinationals have expanded in the wake of BRI, especially with oil and gas projects in former Soviet states like Turkmenistan, Kazakhstan, and Azerbaijan. Although NASA is banned from engaging in any project or contract with China or a Chinese company, and American companies face significant restrictions due to export controls, there is still room for second- and third-order benefits. In the case of the Space Silk Road and the increased communications technology it may bring, should it come to fruition, increased access to developing countries participating in the Belt and Road Initiative could allow American businesses to expand their operations once the ground had been softened by Chinese investment in communications technologies. Better satellite networks could help bring more connectivity to Belt and Road countries, paving avenues for future expansion in ecommerce, for example. That said, such investment opportunities would not come without risks – technology transfer and theft of intellectual property remain serious challenges for foreign companies operating in China and working with Chinese partners. The development of Chinese space technology and infrastructure may not yet rival that of the United States, Russia, or the European Union – but it is expanding. A combination of the political pressure of the ‘going out’ policy and the Belt and Road Initiative and the economic pressure of potential profits to be gained is driving Chinese companies and agencies to push their technical boundaries. The growing expertise of government and commercial Chinese entities is not likely to slow anytime soon, and as they increasingly find their footing in the industry, the gap between China and its rivals may begin to shrink.